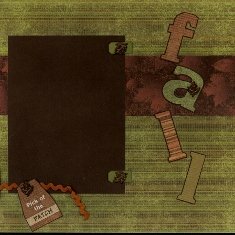 Below are a number of Personal Shopper Scrapbook Layouts that I have put together using their Monthly Scrapbook Kits available on PaperWishes.com . 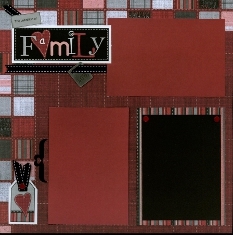 I really like their kits as they contain everything you will need to put together some beautiful and elaborate Scrapbook Layouts without the need for a bunch of elaborate tools. Everything you need is included in the kits, including some directions for putting together a few pages and even some cards. Personally, I love their clear and easy instructions, but I often find that when I am assembling, I have some photos that may take me in different directions. Therefore, what you see here starts with their layouts, but may divert to my own here and there. What I have done is try to keep each set of layouts within the confines of the kit itself. When I have added something from another kit or from my stash, I will let you know. 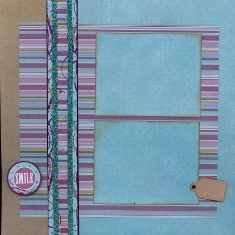 All in all, I have been very impressed with the quality and diversity of the Personal Shopper Scrapbook Layouts that I can put together from their Kits. I learn several new techniques each month and get to sample some of the newest products and my pages are always easy. 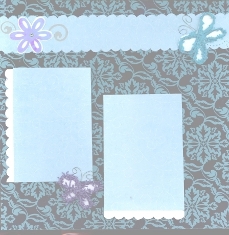 Supplies used above are from the May 2010 Personal Shopper Scrapbook Kit, including the die cuts that match the patterned and solid papers and the ribbon in the border and the Aqua Rhinestones attached to the tags. 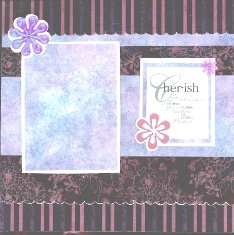 I have added my own white card stock cut as a double matte behind the purple mattes and to tie into the white scroll detail on the border. 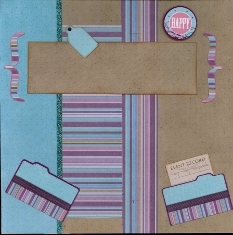 Again, all items from the May 2010 Personal Shopper Scrapbook Layouts Kit, including the glitter and the sticky tape to adhere the glitter, the die cuts to match the striped and subtly patterned paper. 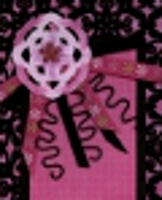 Paper Wishes uses this combination of papers for a boy. 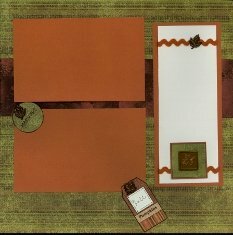 Using their layout guides, I have finally become comfortable with using different patterned papers together, but the papers in these kits are beautifully matched and make it easy to do. Items above are from the April 2010 Personal Shopper Scrapbook Layout Kits, with the exception of the white card stock from my stash for the journaling block. The borders at the tops of the pages as well as the decorations were from the enclosed Dazzles. I stuck them to white card stock and colored them in with my Copic Markers. I could have colored with chalk, acrylics, or colored pencils or just left them white. Or, I could have stuck them to pieces of colored paper and trimmed around the edges of the dazzles. 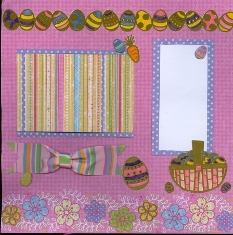 Also included in the kit were Easter Egg Brads and the beautiful wide Striped Satin Ribbon. 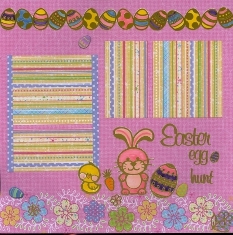 These bright and cheerful layouts from the April 2010 Kit are started with a Border Print and accented with 3 coordinating papers and Gold Scrapbooking Dazzles. 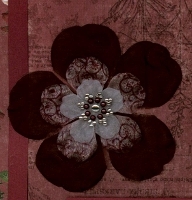 The kit came with beautiful Wired Ribbon and directions to make flowers, but these flowers from my stash had sentimental value and I used them instead. I used some Pink Crystal Heart Brads from the Kit for the Centers. 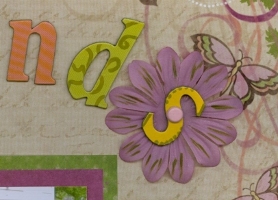 More detail on the Floral Embellishments include more Gold Scrapbooking Dazzles. The Bee Dazzles were placed on white card stock and colored yellow and black with my Copic Markers with the addition of the dotted "Flight Path". Also added was the Aqua Wired Memory Thread which also came in the kit. 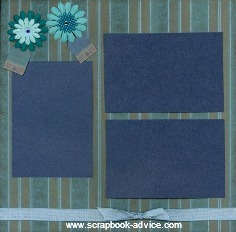 All items in these layouts were also from the April 2010 Personal Shopper Scrapbook Kit. 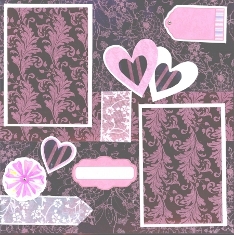 The diversity of the offerings from Personal Shopper Monthly Kits show with this Pink Tapestry Flocked paper. 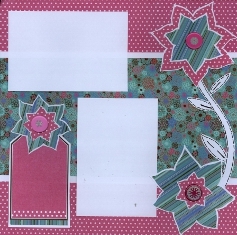 The Flower embellishments made from Kirigami using the Kirigami Paper Art Stencil, Flower Brads for centers and Black Memory Thread from DMC, all of which were supplied in the kit. 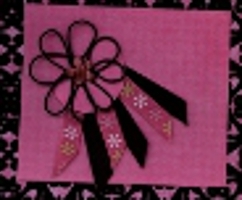 I added Pink print and Black ribbon from my stash. Supplies for these Layouts all came from the April 2010 Kit. 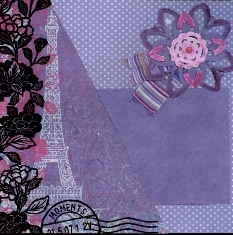 The background is one piece of the Flocked paper called "Moments" cut on the Diagonal with the other half the Lavender with White Dots and Sponged Purple for the Mattes. 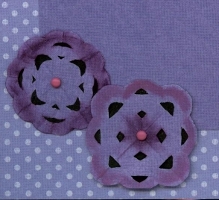 The embellishments are paper Kirigami Flowers made from the Kit enclosed Template called "Kirigami Paper Arts". 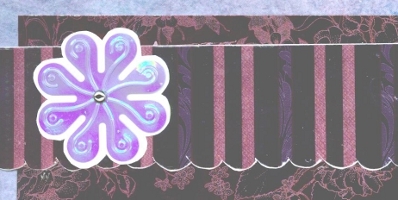 Once the paper was traced, cut out and folded, parts of the petals were chalked with Purple and Pink and attached to one another with Pink Brads and laid over a Wide Purple Striped Ribbon. 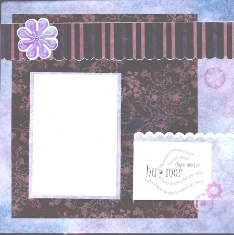 These Personal Shopper Scrapbook Layouts use supplies from the March 2010 Kit, with the exception of the Flourish made with the Paper Wishes Swirls & flowers Template #4002444. 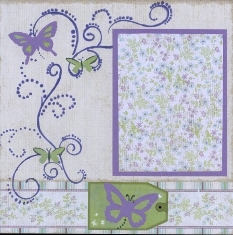 I traced using the Template with a Lavender Copic Marker and added Butterfly shapes cut from the paper provided using the Butterflies and Dragonflies Stencil that came with the kit. 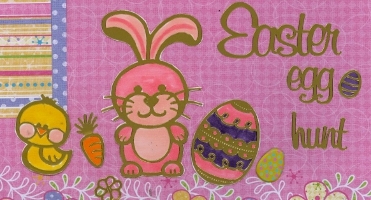 Again, you do not have to use the Stencil for the Flourish, as this could be done freehand with a Calligraphy Pen, Acrylics, Chalks or Colored Pencils. 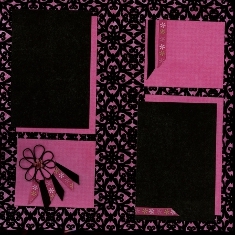 Or, the side design could be left off altogether and replaced with another mat or journaling block. 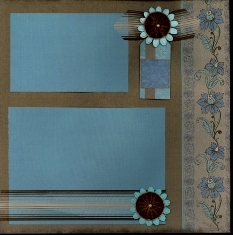 I used the beautiful Turquoise and Brown Border Paper from the March 2010 kit and combined it with photo mattes cut from the Solid Turquoise from the May 2010 Kit. 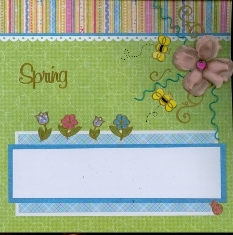 Tags from the March 2010 Kit were combined with the Wide Brown Striped Ribbon, and accented with Turquoise Silk Flowers (from my Stash) and Brown Velvet Flowers with Pearl Centers. These layouts come from the March 2010 Kit. 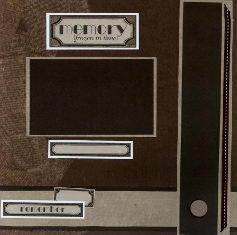 The beautiful Rust border paper with Roses on the one side is accented with a Copper Metallic paper with border strips and photo mattes, plus the addition of Brown and Beige Sheer Flowers, centered with intricate Pearl and Jeweled Stickers. 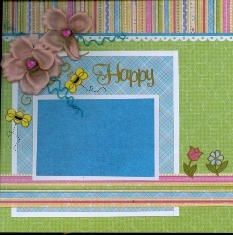 Also enclosed with the kit was a very intricate Swirl Border Stamp. The ink used was a Copper Ink from my stash. 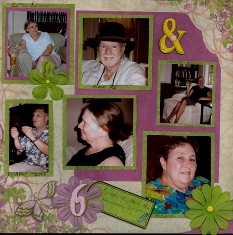 These layouts from the March 2010 Personal Shopper Scrapbook Layouts Kit were my own design. I used the aqua, blue and tan striped background and coordination floral background with a beautiful Dark Blue Metallic for photo mattes. 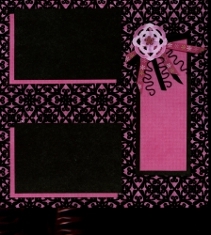 Also from the kit were the Tags to match (actually they helped to match up the papers) as well as the Metallic Ribbon and the Rhinestones for the Flower Centers. 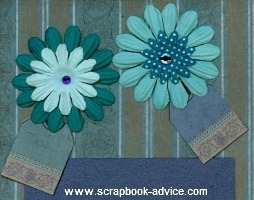 The Aqua Flowers were from my stash - I have a thing for Aqua this month and I needed to use them. 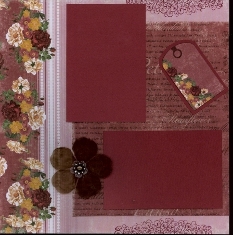 All supplies for these Layouts came from the Feb 2010 Kit.The interesting addition to this kit was Floral Dazzles that were sticky on both sides, Raspberry Pink Glitter and instructions on how to best use the Glitter on the Dazzles. Other Silver Dazzles were used along with Wide Pink Sheer Ribbon, Tags and Large Pink Brads with small Floral Dazzles on top. Also note the addition of the pen work to look like stitching around the outside of the Light Green Mat. These two layouts use paper from the Feb 2010 Kit, but I remember seeing the layout so it must have been from one of the DVD's that come with every other monthly kit. The only item added to complete these layouts was white card stock for mattes. 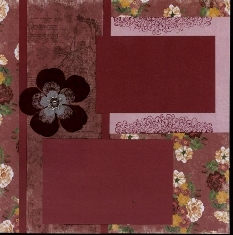 The Flowers were cut using a stencil for the pattern, in three sizes from 2 patterned papers. 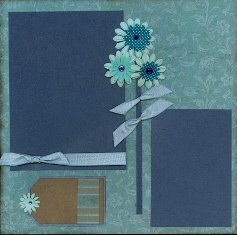 Each flower piece was matted with a white card stock that was free hand cut about 1/8 inch larger than the printed paper. Each was put together with a large Pink Brad, topped with a Silver Dazzle. The Stems & Leaves for the Flowers were hand drawn and cut, then inked with a stitching pattern in black before being attached to the layout. 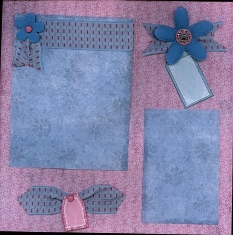 These layouts were my own using Pink & Blue Sponged paper from the Feb 2010 Kit along with the Pink & Blue Ribbon and Tags. 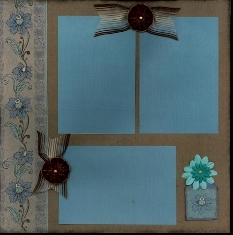 The Blue Flowers were from my stash, accented with Large & Small Pink Brads with each flower center done differently accented with pearls & Rub-ons or a combination of both. 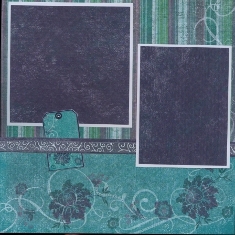 These two layouts from the Jan 2010 Kit have for a background the Aqua Flourishes Foil with mattes and border strips from a Sponged Aqua paper. 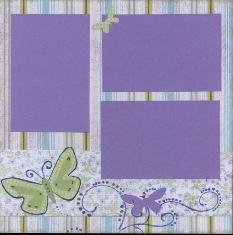 The embellishments consist of Aqua and Purple Paper Ribbon to make the Butterflies backed by White Card Stock. The antenna for the Butterflies is made of wire pulled from ribbon used on another page. The wire is inked black with a marker to help it stand out. The Butterflies have a "Flight Path" hand inked in with little dots. 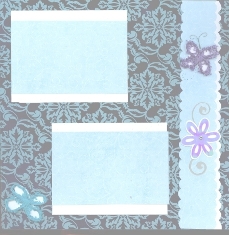 The Border Strip also used Aqua Iridescent Flowers backed by White Card Stock and some Silver Dazzle Swirls and attached with Silver Brads. 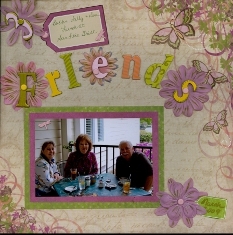 The Borders and 2 of the photo mattes are accented with Scalloped Edges from the "Scrapbook Spinner Template" also enclosed with this kit. The Silver portion of the Foil paper looks Black in these shots because of the light reflections. There is no black at all on these pages. 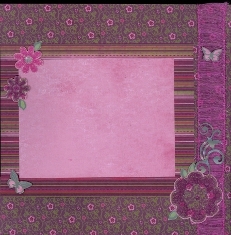 More of the Jan 2010 Kit Layouts using the stunning Pink Foil papers called Pink Flourishes and Outline Floral. The only addition to the kit was my White Card Stock used as mattes. 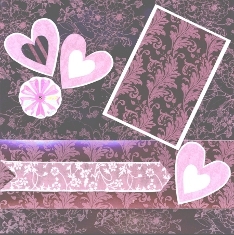 The Heart shapes were traced using the Scrapbook Spinner Template. 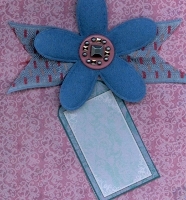 Also used were 2 Iridescent Flowers attached with Silver Brads, Cut Out Tags, and the White Floral Ribbon. More of the Stunning Foil Papers from the Jan 2010 Kit. 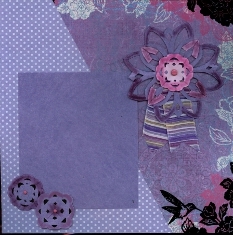 Here there are 2 Foil Papers, the Floral with pink and purple and the Purple Stripe Foil, mixed with the Purple Sponge Paper. 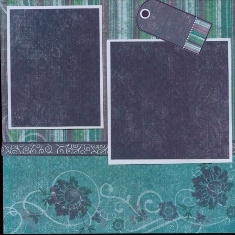 Again, the only addition not from the kit was the White Card Stock for photo and journaling mattes. 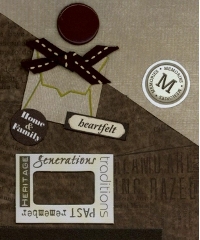 The Foil Papers were trimmed into borders and Scalloped using the edge of the Scrapbook Spinner Template. 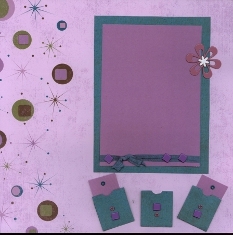 The addition of the Purple Iridescent Flowers, a large Pink Brad Buddy with Floral Brad, and 2 pre-printed Journaling Blocks from the booklet "Definitions and Words Ephemera (227 images)" were all items that came in the kit. Jan 2010 was an awesome collection. The letters and numbers used on the Layouts were several different colors and to complete the layout, I decorated many of the numbers and letters with the Gold "Zig" Writer - some were covered completely, some bordered, some have designs added. 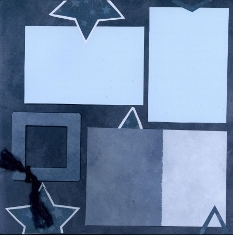 These Layouts from the Personal Shopper Scrapbook Layout Kit are from the July 2009 Kit which included a paper pack of Color Block Matching Papers - with 6 sheets of each color combination. Colors are Pinks, Grays, Tans, Greens, and the Blues. That's 30 papers ready made for easy matting - the potential for 15 double sided layouts. 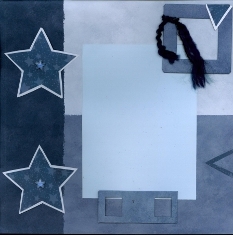 I used the Spinner Template from the Jan 2010 Kit for the Blue Stars with White Matting, and the Blue Star Brads from the April 2010 Kit and the Large Slide Mounts and blue fibers from a Kit I ordered from Paper Wishes about a year ago. The Slide Mount Kit came with a group of 8 1/2 x 11 papers, various sizes and shapes of Slide Mounts, fibers, ribbons and a booklet with 145 project Ideas called Slide Mount Mania by Hot off The Press. 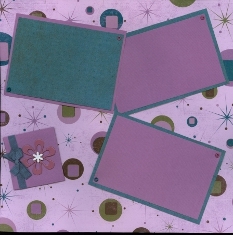 Also included with the Slide Mount Kit was a Template called Slide Mount Mania to make your own from paper and card stock. 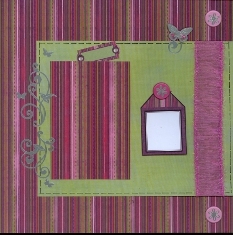 This item is still available at this link for Paper Wishes Slide Mount Mania Bundle. 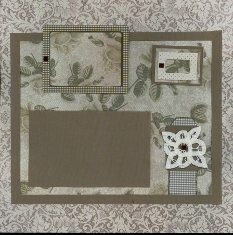 These beautiful Taupe and Ivory Layouts came from the November 2006 Kit and all items are beautifully color matched - which to me is a sign of careful planning & something that's really hard to do if you are purchasing items separately. What a beautiful background for some of those scarce vintage photos we have or our departed relatives. 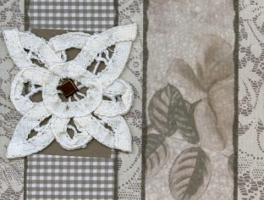 Complete with the ribbon, frames and lace pieces, these layouts remind me of my grandmother's table cloth. These layouts, along the same Heritage Line, will also do well for photos featuring your favorite gentleman. 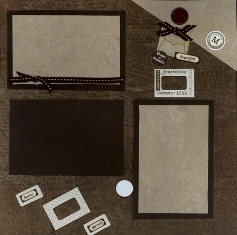 Again, All matched for color with frames, chipboard pieces, large brads, and cut outs. 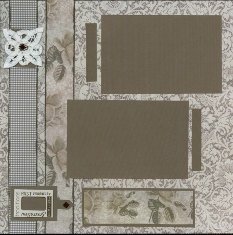 These Retro pages show just how diverse the papers and embellishments in each of the Personal Shopper Layout Kits can be. 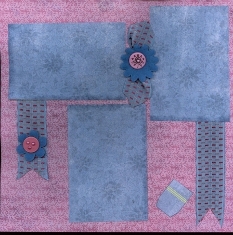 Large Pink Floral Brad Buddies, Square Brads and Eyelets with Ribbon to match both paper colors is a real deal. 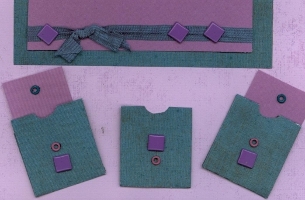 The Embellishments are 3 small and 1 medium Library Card Holder to hold journaling tags - and they have provided you the instructions and template to make those as well. was cut out of card stock. 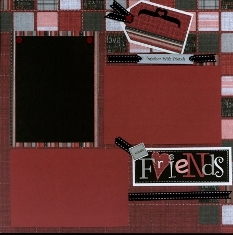 All the supplies for these Personal Shopper Scrapbook Layouts were provided in the Nov 2006 Kit including the Ribbon Slide that says "Together With Friends", the Black Ribbon with White Dashes, the Tags, the Love Charm, and the Red Brads to attach the ribbon to the Tags and at the Top of the Photo Mattes. 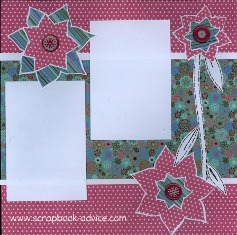 Check out more Personal Shopper Scrapbook Layouts from 2011 Kits.